The IMPRESS 3 introduces a new generation of harnesses to the thermal, cross country and competition pilot. This logical continuation of the unique seatboardless LIGHTNESS concept provides the highest degree of comfort, and is aerodynamically as good as you can get. With an EN/LTF certified back protector the IMPRESS 3 is extremely light - only 4.7 kg - and compact. The IMPRESS 3 introduces a new generation of harnesses to the thermal, cross country and competition pilot. This logical continuation of the unique seatboardless LIGHTNESS concept provides the highest degree of comfort, and is aerodynamically as good as you can get. With a new low-profile EN/LTF certified back protector the IMPRESS 3 is extremely light - only 4.7 kg* for medium size - and compact. With this new design - without a seatboard - your body weight is supported by an ergonomic, crease-free seat surface, meaning that you definitely sit (or lie) more comfortably in the harness. This design does not create those pressure points that become a nuisance on long flights, and this is a clear advantage compared with a conventional harness. The IMPRESS 3 weighs only 4.7 kg* – quite revolutionary for a harness with speedbag and an EN/LTF approved foam protector. This weight reduction results from the sum total of numerous design and material details; lighter materials and innovative design also considerably reduce the packed volume. * Flybubble note: We weighed one of Advance Impress 3 M we have on our electronic scales, with all included accessories, and it weighs approx 4.7 Kg. It’s not the paraglider, it’s the harness that is the most important factor when choosing a glider bag – it’s the harness that affects the carrying comfort and the compactness of the whole system. That is why the new COMFORTPACK is an integral component of the IMPRESS 3, and can be delivered in a size that matches the harness. Carrying comfort is even better with this geometrically optimised packsack, designed so that its volume is filled as efficiently as possible. Which pilots is the IMPRESS 3 suitable for? The IMPRESS 3 is suitable for thermal, cross country and competition pilots - and anyone else who values aerodynamic excellence and would miss the warm comfort of a speedbag. Why does the IMPRESS 3 not have a seatboard? Like the LIGHTNESS the IMPRESS 3 uses a novel (for paraglider harnesses) hammock principle, which perfectly adapts itself to the body shape of any pilot. With this seating shell design the harness takes up an ergonomic shape, supporting the body over its whole area and thereby providing the highest possible level of comfort. The hammock principle also means that annoying pressure points do not arise on long flights, and, not to be ignored, no seatboard means less weight. How does the new chest strap/speedbag safety link work? The chest strap/speedbag safety link comes into action as the speedbag is closed. When the pilot closes the speedbag he must actually hold the link (permanently connected to the chest/leg straps) in his hand, so that the pilot is reminded to close the chest/leg straps. In fact it reduces a very real danger if the pilot does forget to fasten the chest strap (and leg straps) before takeoff having already closed the speedbag. This link prevents the pilot falling out of the harness after the next takeoff if he has opened the leg/chest strap but left the speedbag closed (e.g. when walking back after a failed takeoff). This is a significant additional safety feature. How can the IMPRESS 3 be so much lighter than the previous Impresses? The weight reduction of around 3 kg is the result of many details to do with the choice of materials, and the design. Compared with the IMPRESS 2+ the IMPRESS 3 is made of lighter but just as robust and durable materials, tested by long and intensive mechanical trials. The IMPRESS 3 really is much lighter than its predecessor, and more comfortable. Why can’t the IMPRESS 3 be flown without the speedbag? If the IMPRESS 3 didn’t have a speedbag it would still have to have a foot support, to prevent the pilot from continuously slipping forward. The speedbag is therefore an integral part of the harness, and the footboard part of it serves as the foot stirrup, for reasons of weight. Compared with the IMPRESS 2 the footboard load is considerably reduced by a new triangular supporting geometry, and comfort is further improved. Can the IMPRESS 3 be combined with a speedbag of a different size? Basically one of the normal three S, M and L sizes with their flexible speedbags should suit almost every pilot. In special cases, however, any harness can be fitted with a speedbag of a different size and ordered as such – all the speedbag sizes are interchangeable. How was the IMPRESS 3 aerodynamically optimised? The IMPRESS 3 has a low drag shape which results from a reduced cross section area (due to the compact protector) and its streamlined silhouette. A lot of information from wind tunnel measurements contributed to the development. The new Cockpit-Spoiler concept also improves the aerodynamic geometry - the spoiler prepares the airflow to meet the upper body and this minimises vortex production at the chest area. Why does the IMPRESS 3 not have a tail extension? Can you take ballast with the IMPRESS 3? The IMPRESS 3 has a ballast compartment just like the previous Impresses - under the seat, near the pilot centre of gravity. It can take 8 litres of water ballast, and the ballast container can be satisfactorily secured. 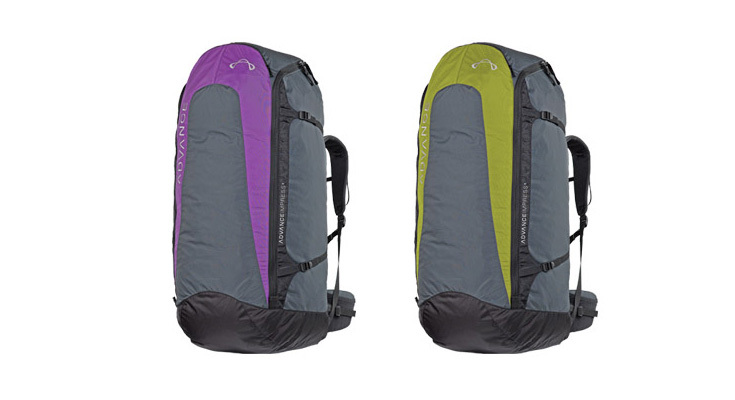 Why is the IMPRESS 3 delivered with a matching packsack? What are the advantages of the new-style reserve system? The reserve compartment is completely closed by a zip fastener; this effectively protects the reserve from outside influences, and accidental releases are now very unlikely. A well-designed mechanism ensures a reliable and fast opening. The reserve compartment can accept a steerable Rogallo parachute, in fact it can accommodate all reserves within a specified volume range. In addition the new reserve system is much less prone to mistakes while being packed. What are the differences from a LIGHTNESS? * Because the hammock system follows the body shape exactly the seating width together with the carabiner height will vary with the pilot dimensions.